Being a part of HCA Healthcare, our HCA East Florida hospitals provide unprecedented career opportunities including the ability to move within our 14 hospitals across Southeast Florida or our 178 hospitals and 1,800 sites of care located in 20 states and the United Kingdom. Grow your Critical Care nursing career with an HCA East Florida hospital. Our Intensive Care departments feature the latest technologies, the most advanced capabilities, and the very best professionals in healthcare. When you select a career with us, you join a dynamic multidisciplinary team dedicated to their patients and each other as well as position yourself for growth opportunities that are amongst the most highly sought after in healthcare. From neurological to cardiovascular intensive care, our ICUs offer you the opportunity to gain unrivalled experience while you practice at the very forefront of healthcare. Whether just starting your nursing career or taking an exciting step into a new RN position, a nursing job at one of our numerous hospitals and facilities will help you continue on a trajectory toward success. We are committed to advancing nursing across the organization by nurturing our nurses through education, professional development and defined pathways for personal and professional growth. Are you looking for an employer with many different career options and a people-focused culture? You’ve come to the right place. HCA East Florida, the largest health system from the Treasure Coast to Miami Dade County, is a network of 14 affiliated hospitals. 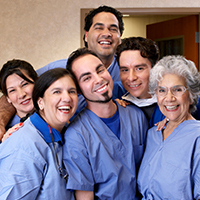 When you join our family of nurses, the opportunties available to you are endless. Being a part of HCA Healthcare, HCA East Florida, provides unprecedented career opportunity including the ability to move within 178+ hospitals and 1,800 sites of care located in 20 states and the United Kingdom. Northwest Medical Center - Celebrating over 30 years of providing quality healthcare to Margate, Coconut Creek, Coral Springs, Parkland and the surrounding communities in Broward County, Florida, Northwest Medical Center is a 228-bed hospital offering medical and surgical programs including open heart surgery, 24-hour Adult and Pediatric ER, maternity, orthopedics, pediatrics, robotic and minimally invasive surgery, heart and vascular, weight loss surgery, rehabilitation, and women’s services. Plantation General Hospital - Plantation General Hospital is a full-service facility that has been providing a range of healthcare services to residents of Plantation and Central Broward County for 45 years. Our nationally recognized centers of excellence in maternity, high risk maternity, pediatrics, pediatric intensive care and Level III neonatal intensive care have earned us a distinguished reputation for quality. University Hospital and Medical Center - University Hospital and Medical Center is a 317-bed acute care hospital. Since opening in 1974, we've been a leader in bringing breakthroughs in orthopedic care and joint replacement. Our Center for Behavioral Health offers inpatient care for children, adolescents and adults and a one-of-a-kind geriatric program. Our Wound Healing Center offers expert care for non-healing wounds. Our Emergency Room offers family-friendly care for children and special amenities for seniors. Westside Regional Medical Center - Westside Regional Medical Center is a 224-bed acute care facility, offering a full spectrum of healthcare services. Our highly skilled team of hospital professionals delivers a comprehensive range of care – from emergency services to our cardiac care program. For over 40 years, we’ve been providing award-winning inpatient and outpatient diagnostic, medical and surgical services to the people of Broward County. Aventura Hospital and Medical Center - Aventura Hospital and Medical Center is a 407 acute care medical/surgery facility providing award winning inpatient and outpatient diagnostic, medical, surgical, cardiovascular and cancer services to the communities of northeast Miami-Dade and southeast Broward counties since 1965. Aventura Hospital and Medical Center is one of the few centers in Miami-Dade County to be certified as a Comprehensive Stroke Center by the State Agency of Health Care Administration. Kendall Regional Medical Center - Kendall Regional Medical Center, an award-winning 417-bed hospital, is recognized for providing a wide array of services to the residents of South Florida, as well as visitors from around the world. We offer 24-hour comprehensive medical, surgical and diagnostic services, including trauma and burn care, pediatrics and maternity services, an orthopedic and spine institute, along with patient and community services. Mercy Hospital - Mercy Hospital has been serving the healthcare needs of South Florida for 60 years. As a comprehensive healthcare facility, Mercy offers a full range of services to the residents of Miami-Dade county and surrounding communities. A 488-bed acute care facility, Mercy Hospital is accredited by Joint Commission. Sister Emmanuel Hospital - We are Miami’s only Catholic long-term hospital co-located with Mercy Hospital. While we share the same values as Mercy, we are separate and distinct as both hospitals have their own governing bodies and medical staff. By partnering with Mercy Hospital we able to provide a wider array of services and capabilities to better serve our patients. JFK Medical Center - Since 1966, JFK Medical Center has evolved into a multi-campus medical center, encompassing four convenient locations throughout Palm Beach County. Our Main Campus in Atlantis is a 486-bed acute care medical and surgical facility known for its Comprehensive Services including: 24-Hour Emergency Services, Cardiovascular Care, Cancer Care, Breast Care, Neurosciences, Stroke Care, General, Minimally Invasive & Robotic Surgery, Orthopedic Care, Spine Care, Bariatrics, Sleep Disorders, Wound Management, Behavioral Health and Obstetrics. JFK Medical Center North Campus - Conveniently located off I-95, JFK Medical Center North Campus, the latest addition to our family, is a 245-bed acute care hospital, with an adjoining 88-bed psychiatric unit, and a medical professional office building. JFK North is the largest provider of Behavioral Health services in Palm Beach County. Palms West Hospital - Located on a spacious 94-acre campus, our 204-bed facility offers top-quality care for a full complement of healthcare services. Palms West has established a position of medical leadership by listening to the needs of people in our community and responding with compassionate, quality health care and innovative new services that meet those needs. Quality healthcare and information you can trust – That’s the winning combination of Palms West Hospital. Highlands Regional Medcal Center - Highlands Regional Medical Center, located in Sebring, Florida is a 126-bed inpatient, full-service facility. Serving the community since 1965, Highlands Regional Medical Center has received numerous awards and recognition as a leading health care provider in Highlands County and surrounding areas offering a full spectrum of services. Lawnwood Regional Medical Center & Heart Institue - Lawnwood Regional Medical Center & Heart Institute is a 380-bed acute care hospital. Home to the Treasure Coast Level II Trauma Center, it provides life-saving care for patients with critical injuries from St. Lucie, Indian River, Okeechobee and Martin counties. Specialty services include a full range of cardiac care from diagnostics to open-heart surgery, Pediatric Intensive Care Unit, Inpatient Behavioral Health, an Inpatient Physical Rehabilitation Center as well as the only Mazor Robotics Program that provides highly-accurate, minimally-invasive surgery for complex spinal cases. Raulerson Hospital - Raulerson Hospital is a 100-bed, acute care facility dedicated to providing local access to a full range of high quality, comprehensive medical care and surgical services. Raulerson Hospital has been serving the community for more than 36 years. The Joint Commission recognized Raulerson Hospital as a Top Performing Hospital in Key Quality Measures in their annual report, Improving America's Hospitals, for the past five years in a row. St. Lucie Medical Center - St. Lucie Medical Center is a 229-bed, hospital offering a full range of acute care services, including rehabilitation, obstetrics, inpatient and outpatient surgery and services. Its Orthopedic Center of Excellence is considered one of the best in the country for joint replacement.St. Lucie Medical Center is accredited by The Joint Commission and designated at a Top Performer, a Certified Primary Stroke Center and is the Chest Pain accredited facility on the Treasure Coast.